A few days ago, the automaker Lotus announced his intention to demonstrate in Geneva, a convertible, meaning most likely a variation model of Evora. 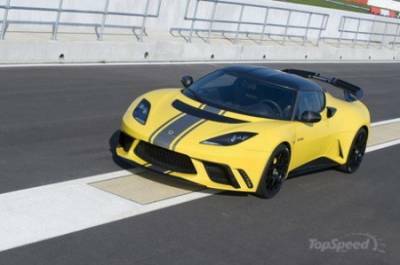 However, just a company representative said, and that the gig will see the light in addition to a special model of Evora. Lotus engineers to create this Evora GTE drew their inspiration from the racing cars of Formula 1. As is usual, the manufacturer is not prepared to provide details on this car before its official debut, but the standard version of the Evora GTE now boasts a carbon fiber front and rear bumpers, carbon fiber rear wing and carbon fiber as the doors. The vehicle is equipped with six-cylinder V-twin engine of 3.5 liters and output of 444 horsepower. And that, unfortunately, everything. The car will remain a mystery until then, until March 6, the exhibition does not open its doors to all comers.